At last - it's the Johnnie B sparkly shoes in action! I wore them on Saturday with a striped jacket from Esprit that I got at the end of the summer sales last year. 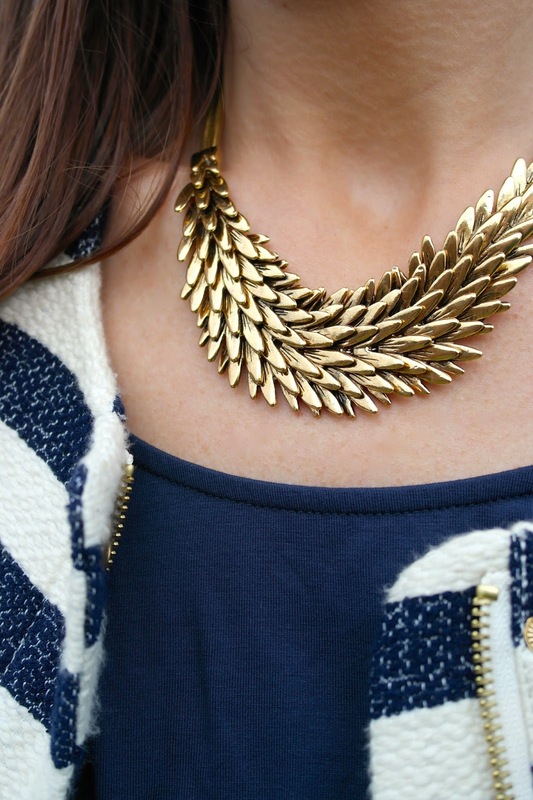 The jacket has gold trim so I've not worn that much as I felt it needed a nice gold necklace. Then I remembered I have a jewellery shop...it was a bit of a duh moment! I need to give you an #OperationFormalDress Update! The one being sent to me arrived and is absolutely perfect in every way. I honestly might have cried with relief when I tried it on. It sounds extreme to cry over a dress but I really was worried! I knew I could pull off an average dress but at important events, if I'm not happy with what I'm wearing, I struggle to relax and enjoy myself. Well I can assure you that there will be muchos relaxing and enjoying ones-self on Saturday night! Saturday morning sees the start of the preparation....with nails by my friend Catherine, followed by make-up by the lovely Lynne at Effortless Beauty in Moira and hair by Gemma Managh - Session Stylist. Both of these ladies are beautifying me free of charge as they read the blog and wanted to be part of my special evening so please show these fairy godmothers some Facebook love! WOW this is SUCH a good look - I love it all from head to toe. Off to check out your very kind pamper god mothers! Fabulous outfit Avril.....love the jacket!! The necklace and shoes totally notch the outfit onto a whole 'nother level!! Wish I could find me a thrifty bargain like your jeans.....no luck whatsoever with your challenge this month!! Oh I love this outfit and so pleased you have your dress sorted and how nice two readers are doing your hair and make up - that is lovely!!! x looking forward to the pictures. 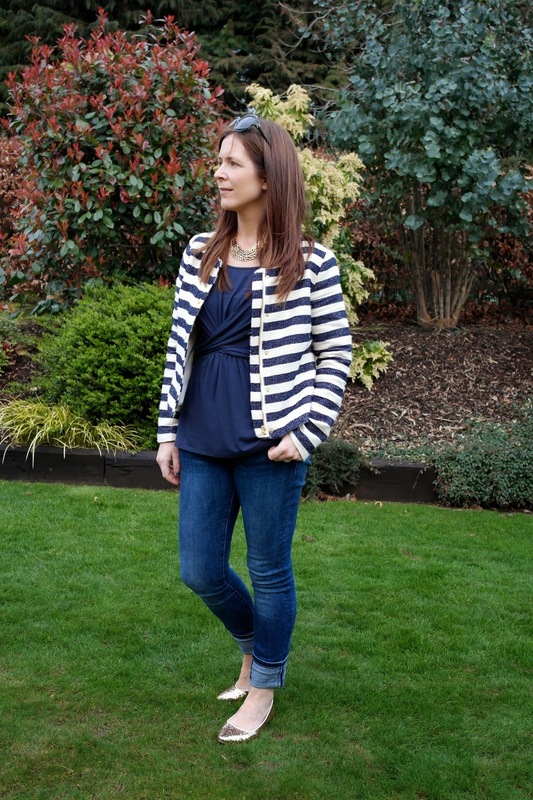 Beautiful jacket Avril - I've been in a little Breton striped dress today! Love this outfit - the jacket, the necklace and the shoes all look so good - Sparkly shoes are just so nice ! Really pleased you got your dress sorted, have great time. Loving the shoes, you can't beat a bit of sparkle. Such a gorgeous look Avril, I love those shoes! Can't wait to see you all glammed up for Saturday! Love this outfit on you especially the jacket. Esprit has pulled out of Canada so now we really have to track it down. Will have to watch for other options here.